Well hello, it seems that many people are reflecting on 2013, and setting resolutions for 2014. I’ve never been one for resolutions, as I am ridiculously bad at keeping them. But I do think it’s important to reflect and look at what I would like to aim for in 2014, so here goes! 1. Running: I am not a particularly sporty person, in fact my nickname at university was ‘Debris’ partly due to the fact that I was known to be terribly uncoordinated, this was gleefully reflected in the ridiculous amount of time it took me to pass my driving test (I am not going to state how long, let’s just say it took a while). 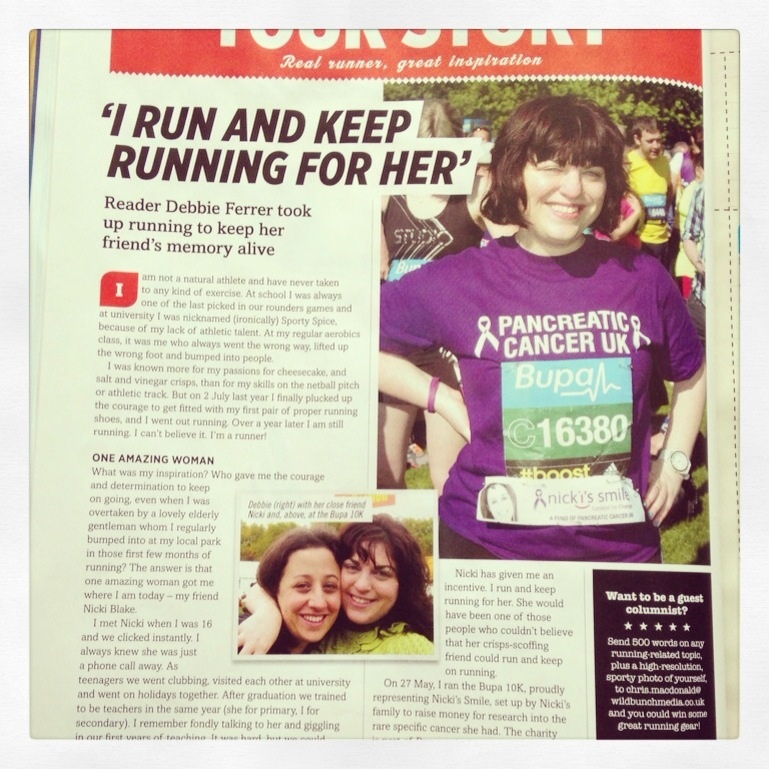 In July 2012 I decided to do something completely out of character and start running, many people were slightly surprised that I decided to run, but I was prompted into raising money in memory of my friend, Nicki. She passed away from a rare form of pancreatic cancer in 2010 and I wanted to do something for her @nickissmile . I can’t quite believe that during 2013 I ran two 10ks and one 5k race and I am still running. 2014 will definitely continue my running journey, I am not going to say how many miles (or km) I want to run, or race for a certain time. I just want to continue running and developing those skills, which have benefitted me in so many other aspects of my life. It’s also been amazing to have a network of runners on Twitter, who have been so mega supportive of me, most notable being: @MissJLud, @Vickitoria35 and @Virkjay for their ongoing simple words of encouragement which mean the world to me. 2. Me: 2013 has been a reflective year in so many ways. I think it’s important to value myself, I don’t mean in a egotistical way, but just to appreciate me. I think I am far too critical of myself and have realised that ‘me’ needs to be valued a whole lot more by ‘me’. I mean, I think the fabulous people I work with, and my amazing family and friends think I darn stupendous. So 2014 is the year I aim to believe in myself! 3. TeachMeets: wow! Now this has been a journey! This year I presented at NATE’s first TeachMeet and also had a Genius Bar at #TLTSouthampton in October. I was very lucky that both Kev Bartle (@kevbartle) and Helene Galdin O Shea (@hgaldinoshea) gave me an opportunity to work with them on their #TMCollaborate in September. I learnt so much, and met some amazing teachers and Twitter people too. In January 2014, I am planning my first ever TeachMeet at my school, #TMBentley. I am so excited and can’t wait for this event. It has been such a collaborative effort, with so many people helping out and working together. So roll on 2014! I hope to be involved in more CPD and continue to learn and collaborate with fellow inspirational colleagues. 4. My pupils: they’re the most important thing. My students teach me so much and help me reflect on my own teaching and learning. I hope to develop and continue to work with my students, promoting a positive teaching, learning and pastoral environment. Despite of the fluxes and changes in curriculum, assessment, exams blah, blah, blah! I aim to provide consistency, support and open doors for every single student I work with; ensuring they can maximise their life chances through education, and also just grow up to be nice, kind people. 5. Theatre: those who know me, know I’m a theatre junkie! This year I’ve seen so much amazing theatre. London is just, well there’s too much to see! Highlights for me has to to anything at The National really. I highly recommend Punchdrunk’s The Drowned Man, Curious Incident and Rory Kinnear’s Othello blew me away too. My theatre highlight of the year was telling a student she was coming to see War Horse, she is a PP pupil and the look of sheer delight on her face, well I’ll never forget it. I highly recommend Mousetrap Theatre (@MousetrapTP), who have been amazing this year. My Year 10s were so excited to see James McAvoy’s Macbeth at Trafalgar Studios. Next year I’m looking forward to seeing King Lear at The National, and Henry V as well as a Taste of Honey. Oooh, I love a bit of drama I do! 6. Working with other colleagues both in my school and forging positive links with others: I am looking forward to working on this aspect of my job as a newly appointed SLE. I have absolutely loved helping colleagues at my school develop on their own classroom skills. I have also learnt so much from this experience. 2014 will be the year I (hopefully) work with other English colleagues and promote positive sharing and links, which will benefit pupils and enhance staff morale and sense of worth, which is something so vital to nurture for schools to flourish. 7. Pilates: I’ve recently started Pilates, as I am looking to develop my running skills. I am a total beginner, hopefully 2014 will be the year I become a Pilates goddess! 8. Family: never underestimate the importance of family. 2014 will welcome a new addition to my clan. Sometime over the next two weeks I will officially be an ‘aunty’! My brother will be a father (this is something that scares and delights me, the boy used to throw darts at my head, which he claims he cannot remember and steal my cherished NMEs every week). I can’t wait to meet her and see my brother and sister in law excel as parents. My only stipulation is I don’t babysit after 11pm! 9. Read more: this is something which desperately falls by the wayside during term time. I want to read more and I aim to get into Dickens this year! 10. Blog more: I am a poor blogger, how do people find the time! I aim to reflect, write, ramble and rant on a more regular basis in 2014. So that’s it. All that’s left to say is bye bye 2013 and a BIG thankyou to all those amazing people who have inspired me so much (you know who you are, I’m not going to list you all) Hello more running, Pilates, TeachMeets, family time, me time, theatre and oh! I forgot! More gigs and healthy juices too! P.s I would also like say thanks to the following people who have been amazing this year too: @ieshasmall, @Gwenelope, @Xris32 (his blog is excellent and has been a fabulous resource for me), @TeacherTweaks (I’ve met both Debbie and Mel this year a number of times, and they were not only super nice, but super inspirational too), @ICTmagic (for letting me host @UKEdChat twice this year, which I thoroughly enjoyed), @MissBex_M , who I also met in 2013, and is someone who has really influenced my teaching (plus we have a shared love of roller coasters! ), my amazing friend and teacher Sarah @purtie22, she’s been a rock this year, putting up with my One Direction rants! Finally, Historian Paul Reed @sommecourt, who has been so helpful at giving me tips on WW1 books to use with my classes. I hope to get some of his expert guidance to support me in creating English/History department linked resources at my school (and collaborate with other colleagues) for the centenary of World War One next year. I know there are many more teachers on Twitter whom I have left out, there are just too many to mention. But that’s just the quality of the innovation and talent out there in our schools. I look forward to meeting more of you in 2014! I’ve been looking for inspiration, I suppose you could say I could be a terrible procrastinator. At #TMCollab last week, I got the advice from some amazing educators to just write. And therefore here I am here, writing my first full blown blog. In some ways it is an amazing time to be a teacher. I am always in awe at the utter creativity and passion that so many of my great profession display. This was plain to see at last week’s #TMCollab, when many colleagues (and Twitter heroes) presented and displayed their passion for learning and ongoing CPD, which is the mark of truly talented educators. As I sit here, with a streaming cold and a pile of marking just grinning at me deviously, I cannot help to think of the the tumultuous and confusing arena that teachers have to navigate. It seems to me that education has never been more political than it is now. As an experienced English teacher going into her 13th year (that’s gone fast!) I now hold a lack of trust in the whole mechanisms of the examination culture which I am a part of. Whether it be the moving of examination grade boundaries, to the tinkering of controlled assessments and speaking and listening grades. I always held the people who looked after and oversaw the examination industry with a degree of trust. However, I only now feel I can question. My students should be taught within a fair system of transparency, mutual respect and trust. I don’t see or feel anything like that coming from those in their Whitehall towers. Teaching has always been something I love, and have always felt passionately that my students should have the opportunity to achieve their goals. I sadly feel that because of the growing gulf between the teaching community and the political agendas of those people who work in Whitehall offices (and never worked in our fine schools) pupils are given a tough time. I have hope though. Our schools are filled with such talented educators, many whom I saw at #TMCollab last week. With such passion and talent, our young people will be supported whatever the political upheaval. So I keep teaching and planning and marking and learning. That’s my job. Well, I’ve decided to finally do it, bite the bullet and start a English teaching, general observational and education blog. I’ve learnt so much from reading other people’s, I think it’s time for me to share myself. Teaching (as we all know) is an ever continuing journey of learning and challenge. That’s the part of the job I relish! So that’s my first blog, short and sweet. I shall return though….soon!